» Ridgid vs Milwaukee – Which Brand Makes the Best Saw? Ridgid vs Milwaukee – Which Brand Makes the Best Saw? ​As you begin the search for a new saw for your workshop, you may be inundated by the variety of brands available on the market to select from (we were too). To help make the decision a little easier to manage we have broken down the difference between Ridgid vs Milwaukee saws. These two competitive brands offer saws for a series of applications, and one may just be right for your next project. Take a look at how these two saw brands differ and find out which one we determined was the best. ​When you compare the brand Ridgid vs Milwaukee, both have a long history that dates back to the 1920s. Ridgid got its start in 1923 by inventing the pipe wrench. Since this time, the company has grown its tool offering, with products that are geared toward professional use. Ridgid provides a solid warranty on its ​products with many of them featuring lifetime coverage. It stands behind its products and focuses on producing ​tools that are designed to make work easier and faster. Related: Ridgid vs Dewalt – Which Brand Makes the Best Saw? The main attraction to Ridgid is the strength of its tools, including its saw lineup. The saw collection includes reciprocating saws, circular saws, miter saws, table saws, and tile saws models. ​Ridgid also produces a strong line of your more basic tools, ranging from hammers and wrenches to sockets and socket organizers. The primary focus of the Ridgid lineup is on plumbing and electrical, so there are a lot of tools dedicated to these trades. ​The tools produced by Milwaukee are also dedicated to professionals like contractors, woodworkers, carpenters, and craftsmen. The company’s history dates back 85 years to 1924 when it launched the Hole Shooter, a ¼ inch capacity drill that could be used with one hand. Since that initial product launch, Milwaukee has introduced hundreds of high quality tools. Their product line spans across more than 500 tools and more than 3500 accessories. Its lineup is marked by products such as the Sawzall Reciprocating Saw, the Hole-Hawg High-Torque Drill, and the Super Sawzall Reciprocating Saw. Milwaukee Tool is committed to electrical powered tools, with many of them powered by Lithium-Ion batteries. The company offers good warranty coverage on its tools, including its many jigsaws. Many of them have lifetime or extended year guarantees. The company’s main focus is on the heavy-duty construction of its tools. It continually innovates with new products and places emphasis on quality. The company excels at producing new tools which make tasks easier using the latest technology available to do so. Related: Milwaukee vs Makita – Which Brand Makes the Best Saw? ​We've put together a comprehensive review, where we found the very best ​band saw on the market​. ​Comparing Ridgid vs Milwaukee is a difficult task. While the two companies certainly offer an extensive range of tools to choose from, they both are aimed at different types of consumers. With Ridgid, the use is primarily electrical and plumbing related with a sprinkling of general purpose tools mixed in. Milwaukee, on the other hand, is more of a general use tool manufacturer which has earned a reputation in the construction industry with its products. It is also a well-known brand with homeowners and novice tool users, even for​ kids. While both companies focus on producing tools like saws, which can make your life easier with their use, Milwaukee has an edge as it does incorporate new technology. Ridgid holds true to its roots and relies on the tried and true methods of producing tools which have worked for generations. Milwaukee looks to update and advance its tool line and is considered a superior brand over Ridgid in several instances. Both companies bill their tool line as heavy-duty or strong in their promotions. When comparing Milwaukee vs Ridgid, Milwaukee takes a strong lead with the durability of its products. Milwaukee is a more widely accepted brand by users than Ridgid, even though they both have been producing tools for nearly the same amount of years. Our main comparison of the two companies comes down to their latest family of products. These are the Ridgid GEN5x vs Milwaukee Fuel. The GEN5X from Ridgid is a line of 18 V tools, including the likes of circular saws, reciprocating saws, drills, and flashlights. The GEN5X uses permanent magnet motors and includes a lifetime service agreement, offering you free parts, batteries, and service. Milwaukee’s Fuel line is fierce with Powerstate brushless motors, RedLithium battery packs, and RedLink Plus intelligence. This builds on the company’s initiative to use the latest technology available. All of the tools have an 18 V platform and include chainsaws, circular saws, Sawzalls, and table saws for a total of more than 150 tools falling under the Fuel M18 family. Milwaukee’s Fuel line is more extensive than the GEN5X from Ridgid. It also has more power and performance, which we appreciate with this level of tools. ​In reviewing Ridgid’s saw line, we don’t have any standout models we would consider must-have options for your workshop. While they do offer a number of different saws, the selection is limited and not of the quality we would choose or recommend you invest in. ​Milwaukee, however, has a solid jigsaw saw we feel is worthy of note. We’ve listed our favorite here and recommend you see how well this top model stacked up. ​Our decision was pretty straightforward. Hands down we selected Milwaukee, especially the Milwaukee 2645-22 M18 Cordless Jigsaw. 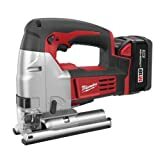 Milwaukee is a reputable brand that really will make those cutting tasks quicker and easier. You get plenty of power with virtually all of their tools, and it has the technology to back the progressiveness of their designs. When you are deciding between Ridgid and Milwaukee saws, we recommend you go with the Milwaukee brand. You’ll appreciate all the features as well as the performance these saws provide.